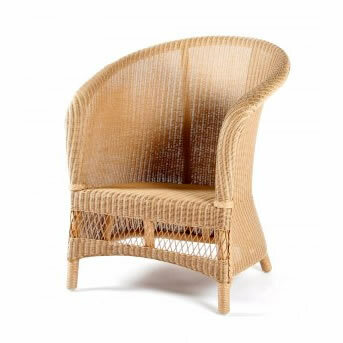 This chair dates from the earliest period of Lusty Lloyd Loom manufacture and was brought back due to popular demand. The skirt front has an attractive fitchwork, or open weave, pattern giving it a decorative trellis effect. The Model 8308 will enhance any room in your house. Designed by Jim Lusty circa 1930. This design can be ordered with a loom skirt instead of the fitchwork. Contact us for details.